Fabric Paint or Pens? You Decide! 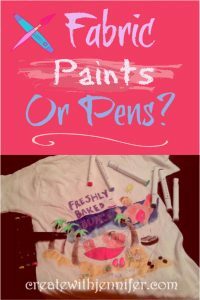 Guys, I’ve got another installment on paint and clothing for you…Fabric paint or pens – which work better? How do each of these work and what does each one work best at? 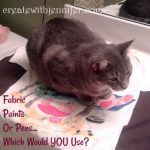 I’ll answer these questions right now!Are you looking for a fun activity for you and the kids involving decorating tshirts, or do you want to get super fancy with advanced techniques? Remember a time back in the day when if you wanted to decorate a tshirt, you had to use something like iron-on transfers or wax crayons? (wow that’s going waaay back!) 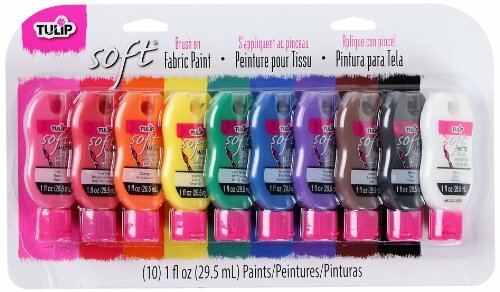 but when fabric paint that you can simply squeeze out from a bottle was invented, it was a major breakthrough! Now whether you use paint or pens can affect the outcome level of detail and depth that can result. So let’s take a look at that one now. What about "permanent markers"? 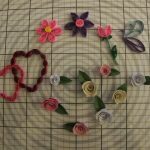 Are they all fabric compatible? 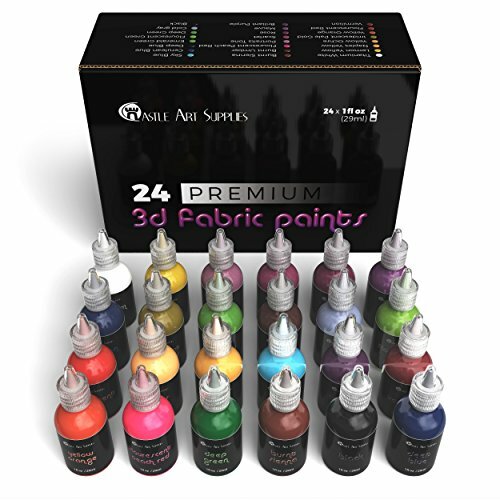 Fabric paints are literally that, if you got a chance to explore my previous post. They are designed to be vibrant in color, permanent, washable and also be able to work their way into the material fibers easily. 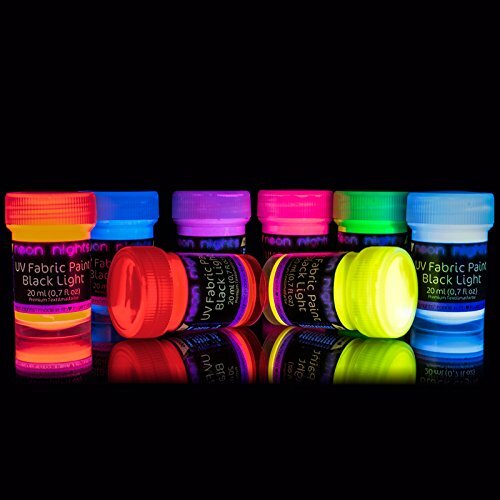 They are highly versatile and able to be brushed, sprayed, stenciled or sponged, and with certain applicator types, you can practically draw on your tshirts or other clothing articles with just the squeeze of a bottle. Fabric markers and pens are a more condensed version. 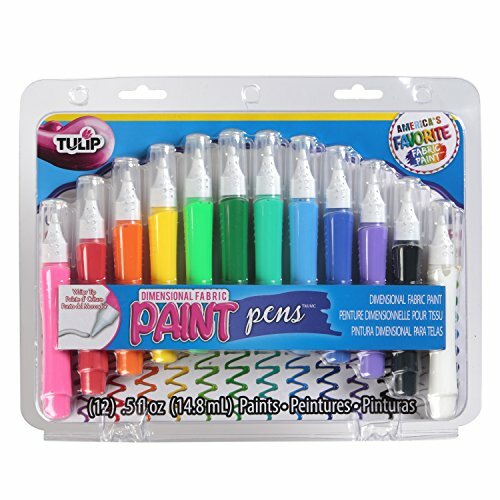 Similar to the kind of coloring markers gradeschool youngsters enjoy using, with vibrant colors and felt – tip applicators, however designed to be permanent when applied. 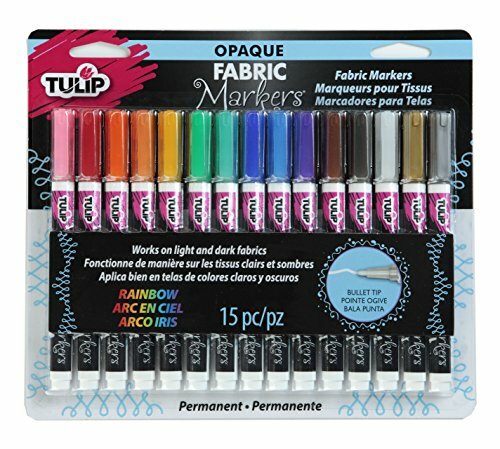 Some types of permanent fabric markers are alcohol – based, which may give them a pertinent odor; and may disqualify them from being labeled non-toxic. I personally loved drawing on clothing...sometimes I drew on other items too, like tote bags, pillowcases, canvas sneakers, heck anything with enough space to be able to produce something! 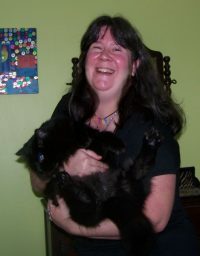 Sputnik the cat loves this cool tshirt…. What about “permanent markers”? Are they all fabric compatible? Check out this dress I attempted artwork on …Would you believe I actually did this design back in 1999 (with Sharpie pens) and the design is still intact? I couldn’t tell you how often it has been washed and worn since then (as I honestly don’t know) but that’s a pretty long time. It may have faded a little bit, in which case I went over it more recently (about two years ago) with a new set of markers I was trying out. Also, you will need to have a firm method of securing your item as marker tips can “drag” across fabric if it isn’t secured well. You may also need to keep a cardboard insert segued in between each side of the fabric item – although fabric markers are designed very well nowadays to not bleed much, they may do so slightly. 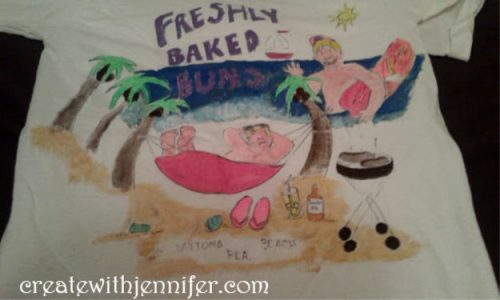 The above image is of a pillow I decorated way back when …it was on polyester believe it or not….Polyester is notoriously slick which meant that the markers I used at the time would not have done much “skipping” while I worked. 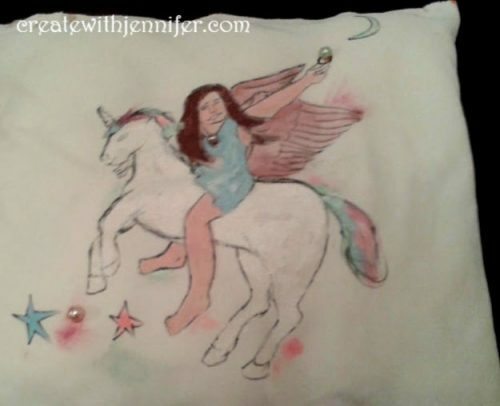 I also embellished that pillow with a little bling too but you get the idea – you can pretty much draw on anything as long as you understand how it works! 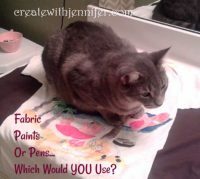 Now as for which of these – fabric paint or markers? For me, it doesn’t have to be an “either or” scenario. I combine them and use both! Hey, why not? 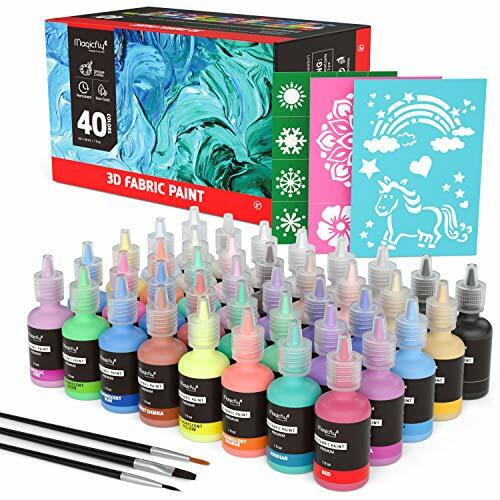 Bring out the best in your wearable art by using paint AND pens!